Despite so many warnings from Microsoft and Cyber Security Experts, Windows XP is still being used by a number of Government organizations, Financial institutions as well as big Corporations all around the world. If we look at the statistics then almost 30% of computers you will find that still run Windows XP, including banks, airline companies, and other huge enterprises, the count in real is likely to be even higher than the estimated. But If you stick with Windows XP after April 8 2014, you might be at a great risk as XP will take its last breath officially on that day and will die! This fact poses danger to its users as they will be exposed to all kinds of threats. Almost thirteen years after it was 'first released' i.e. April 8 when the Redmond, Washington-headquartered Corporation will stop support for its longest running and most successful OS, Windows XP. Continue using Windows XP after April 8, it will serve you as a Dead Zombie, because Microsoft will no longer support its own Operating System. So, the bugs and Security vulnerabilities will go forever unpatched. 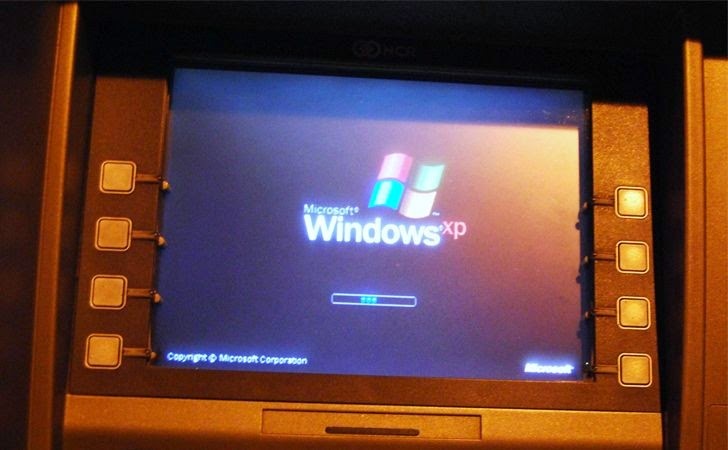 It’s difficult to believe that around 95% of the 420,000 bank’s ATMs in the USA, the country which is known for the world’s largest National Cyber Security Division, also run on Windows XP, but after the deadline if a serious security flaw or vulnerability is found in Windows XP, the banks on their own will defend against the increasingly high-tech cyber criminals. Since there is almost 29% of the desktop market share worldwide running the older version of Windows; So, a malware of epic scale could be fabricated if a suitable zero-day vulnerability was found and it’s beyond your reach that what damage and destruction, cyber criminals might cause with such exploits. As currently 95 percent of banks’ ATMs run XP which is around 2.2 million machines worldwide. So, it’s difficult to upgrade it all to Windows 7 by the April deadline, therefore the banks have arranged or are in the process of arranging extended support for Windows XP from Microsoft. It is estimated that for British banks alone, the cost of extending support for Windows XP would be around £50 to £60 million. "There are certainly large enterprise customers who haven't finished their migrations yet and are purchasing custom support," a spokesman for Microsoft told a Reuters. But, you are strongly advised to upgrade your system or if your friends or family members are still running the older version, help them upgrade to Windows 7/8 as soon as possible.